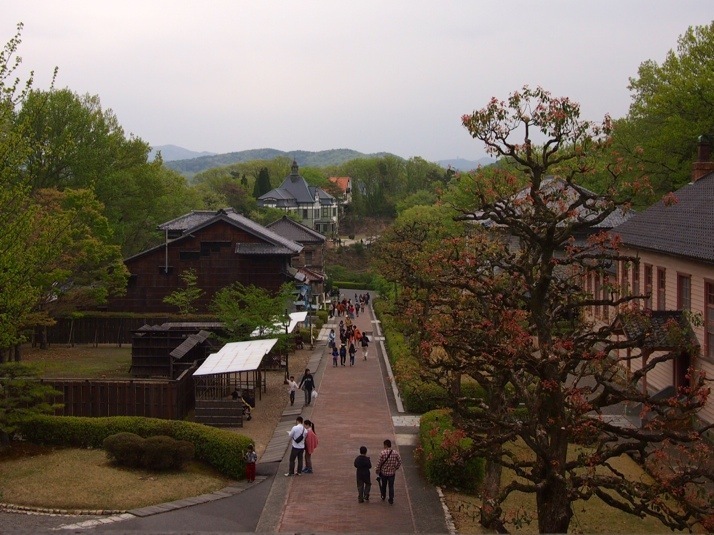 You wouldn’t think that just a week after visiting the Hida Folk Village in Takayama we’d want to go to another museum preserving old buildings, but this one has a very different focus from any of the other outdoor museums that we’ve been to. 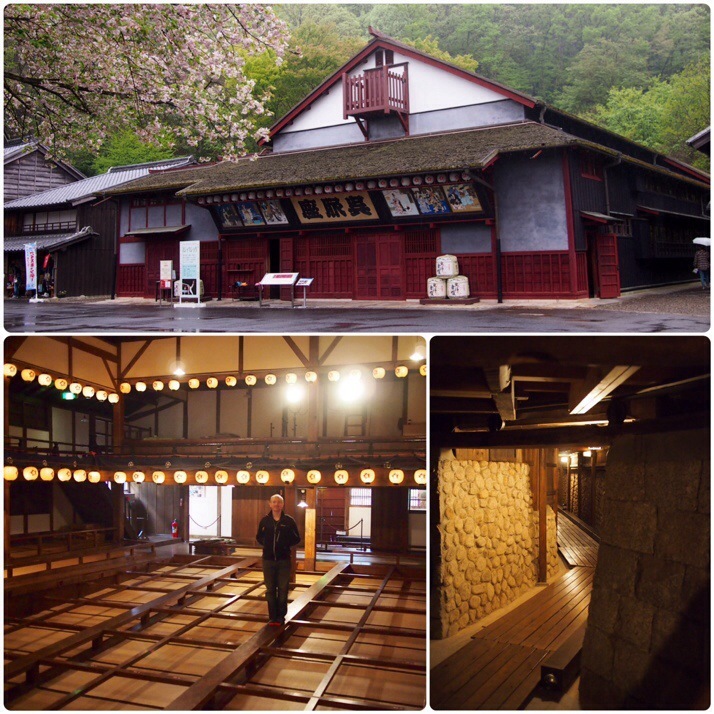 Meiji-mura doesn’t focus on traditional wooden architecture but examples from Japan’s Meiji Era (1868 – 1912). This period marked an opening of Japan to foreigners and the architecture is notable for combining Western and Japanese elements. 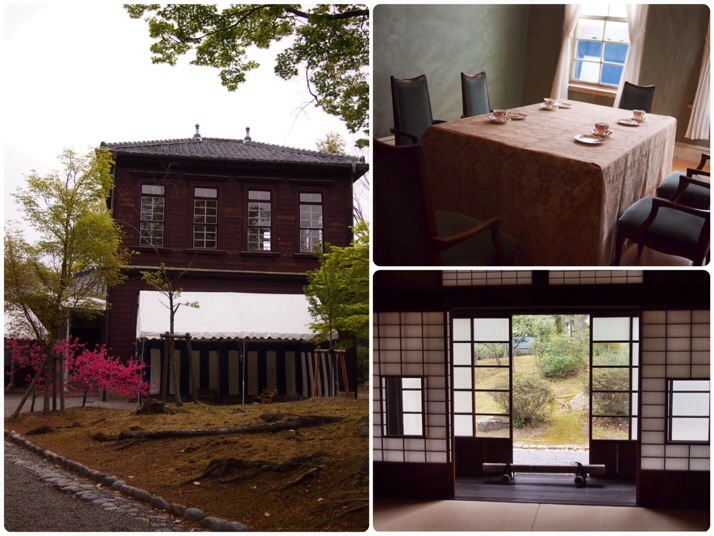 For example, the Principal’s Official Residence of Peers’ School is effectively split down the middle with European style office and reception rooms on one side with high ceilings and wide staircases, and Japanese style family rooms on the other with tatami floors and sliding paper doors. 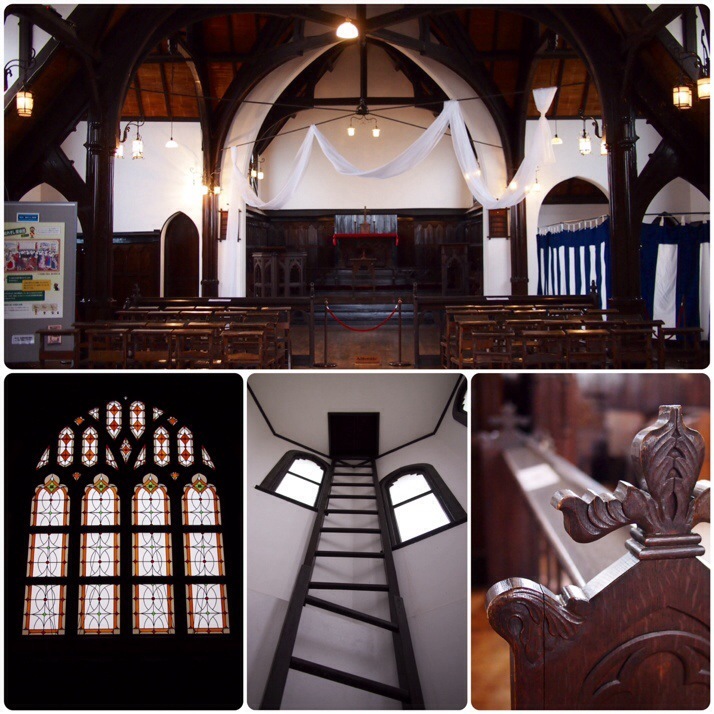 The museum contains more than sixty buildings with a huge diversity of original uses, from churches, shops and houses to prisons, a theatre and a lighthouse. 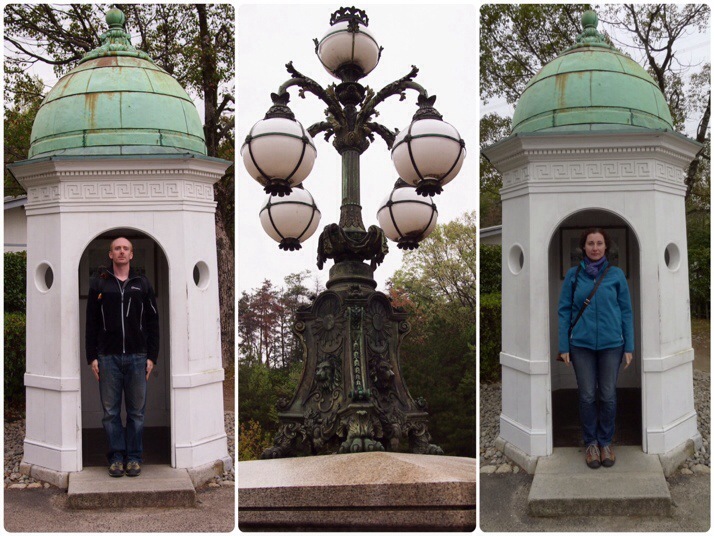 Despite the grey weather and drizzly rain that arrived in the afternoon we really enjoyed the variety of different buildings and their lakeside location and found that even a full day wasn’t enough to see everything. 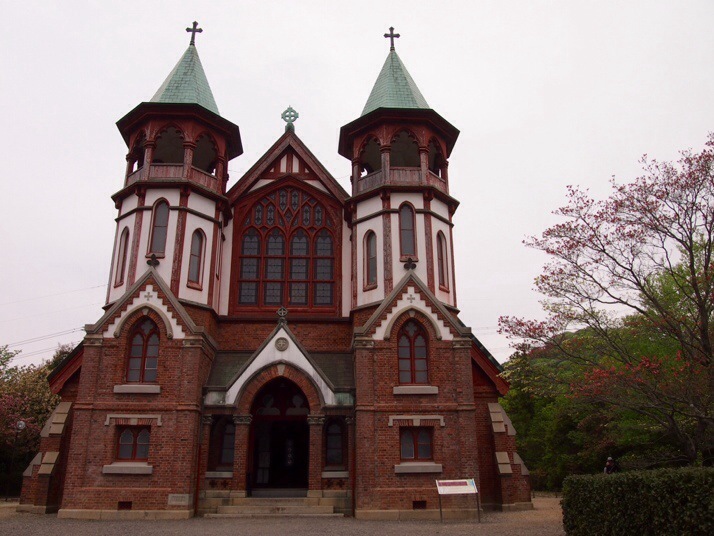 The imposing St John’s Anglican Church was built in 1907 and originally sited in Kyoto. It’s structure is adapted to withstand earthquakes being brick on the first floor and wooden above with a copper roof. 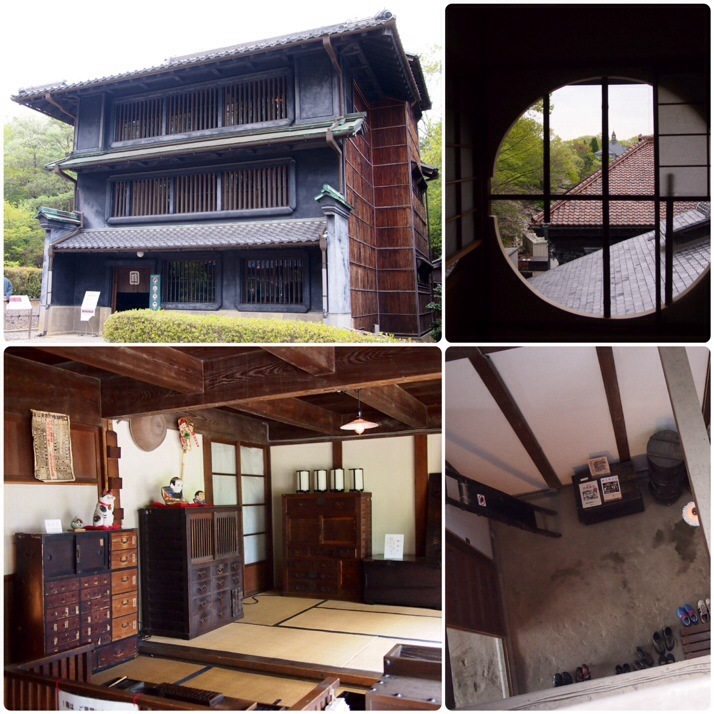 Tomatsu house was a tradesman’s house in Nagoya City. Although it looks fairly small from the front, inside it is a rabbit warren of rooms and passageways. It also contained the coolest stairs we’ve ever seen with drawers hidden in the risers (unfortunately we didn’t get chance to snap a photo). Clockwise from top left: facade, view from an upper floor window, the owner could sit in this room at the top of the atrium and listen to the conversations below, reconstruction of the office at the front of the building. 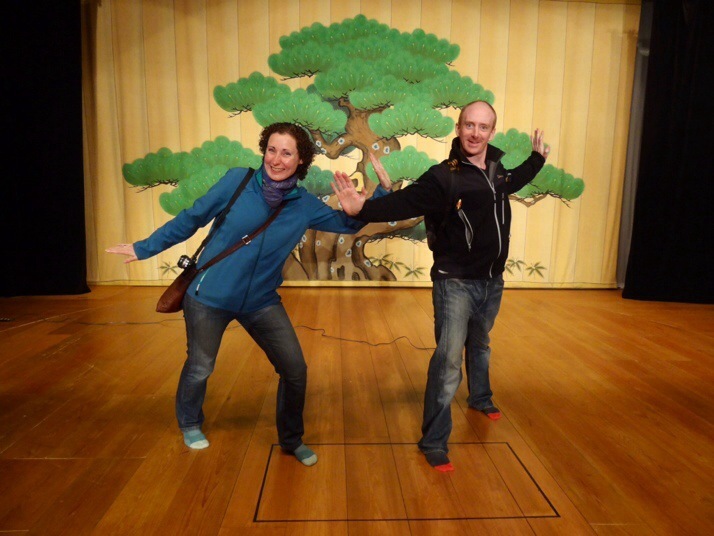 We met this lovely lady in the rather incongruous setting of the Kanazawa Prison. 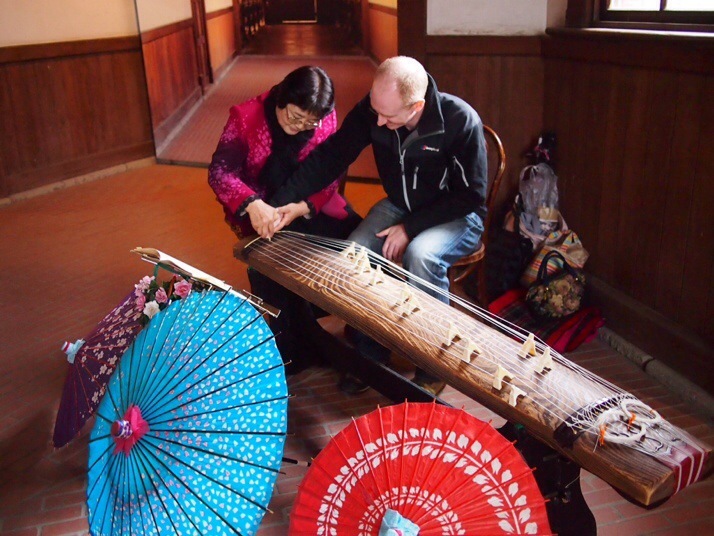 She helped each of us play a short tune on her koto before searching her music book for something English, Auld Lang Syne was the closest she could find! One of the highlights of the museum is the magnificent main entrance and lobby of the Imperial Hotel. 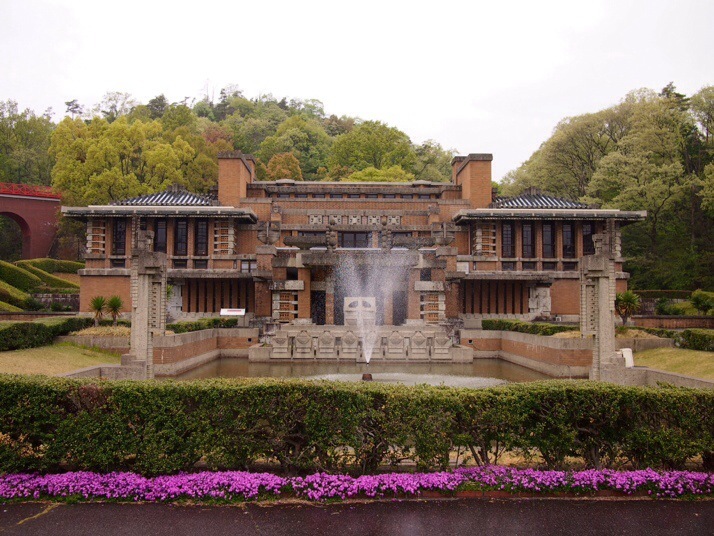 The Tokyo hotel originally opened in 1890, and this redesign by American architect Frank Lloyd Wright opened in 1923. 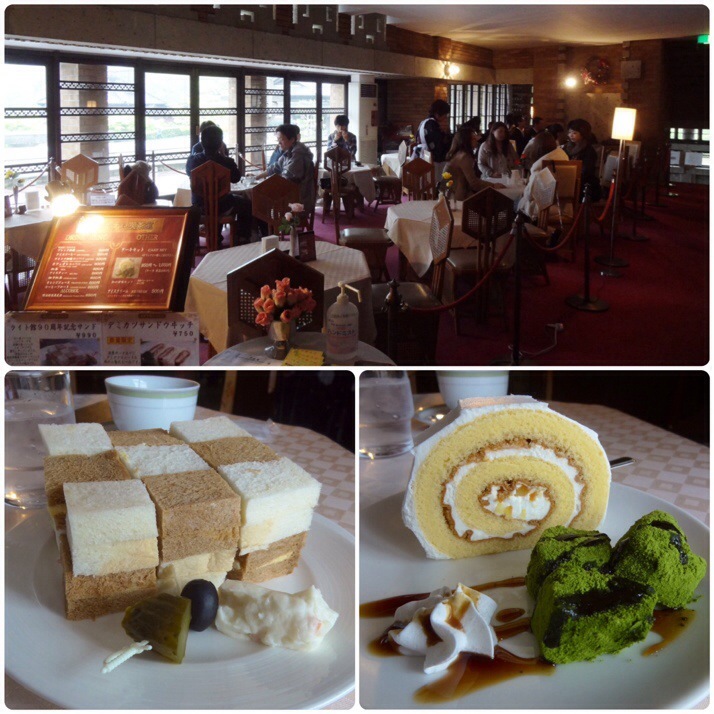 This portion of the building was moved to Meiji-mura when the hotel was revamped again in the late 1960s. Part of the site contains buildings with an industrial history. 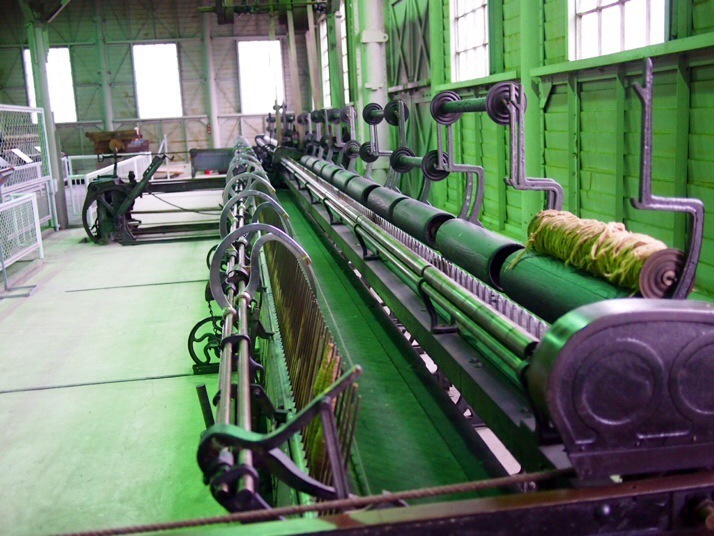 The Shimbashi Factory of the Japan National Railways where railway carriages were once built now contains a collection of industrial machinery, much of it linked to spinning and weaving. 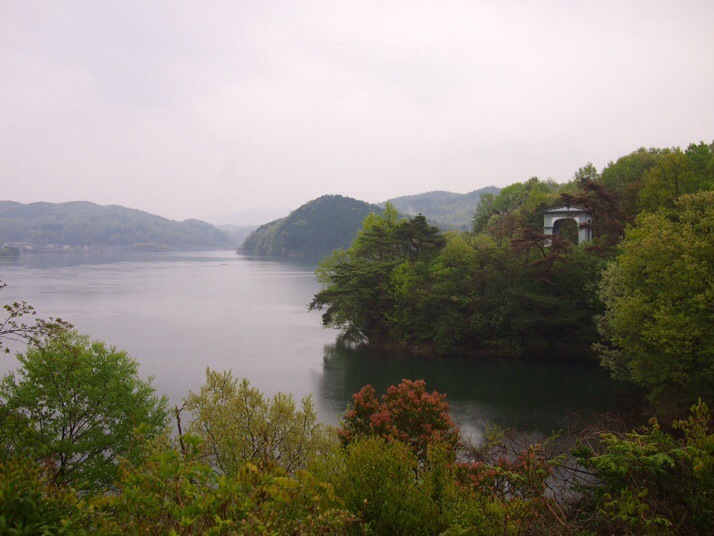 A drizzly view from the edge of the museum site over Lake Iruka. The structure on the right is all that remains of a Tokyo religious college, its entrance porch. 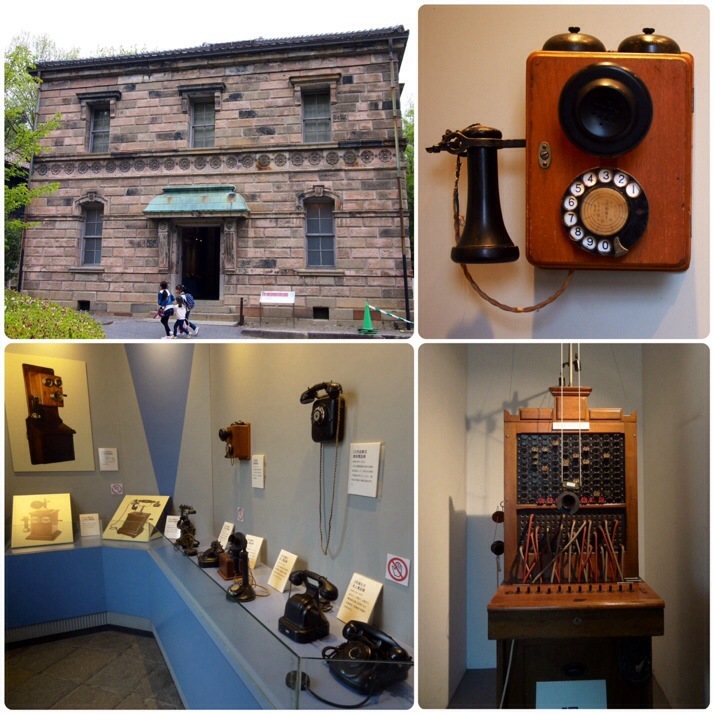 This entry was posted in Places and tagged Japan, Meiji Mura, Museum on May 29, 2014 by Julie. 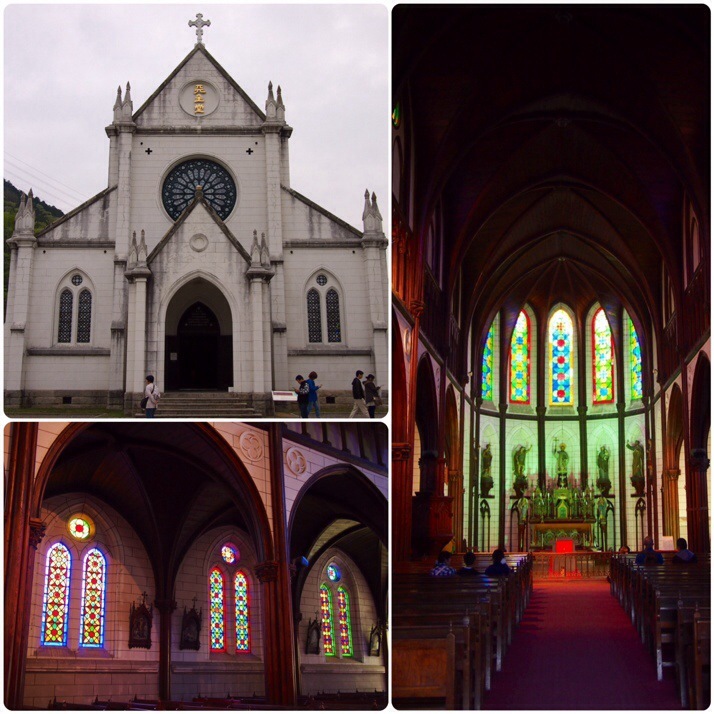 Fascinating place… Looks something akin to Beamish on speed!! Incidentally, big news locally is that Beamish has just announced it has received a grant of £10m from National Lottery to extend the transport system (more trains and trams and roadways), build a small estate of 1950’s style houses, a farm from same era, and possibly some offices/factories. A further grant of £8m is likely to be approved for next year. I doubt if any of this will match up to the very beautiful example of Frank Lloyd Wright’s work of the hotel. (Hope you still have that glass plaque of his work packed away safely?). Although drizzly, the photos are great and full of life. As to the koto playing, well, wayyy toooo many strings for me; I’m still trying to get to grips with the eight I have on the mandolin! It is very similar in vision to Beamish even if the buildings that they’re preserving here are quite different. Good news for them on the National Lottery money, it sounds like a big expansion. The koto sounded lovely and it was great to be near the action end of it even if all I did was relax my arm while she moved it over the strings!